No. 4 Virginia picked up a big win Monday. The Cavaliers pulled out a 69-61 victory over No. 8 North Carolina at the Dean E. Smith Center, despite blowing a seven-point halftime lead. The loss snapped the Tar Heels’ seven-game winning streak. 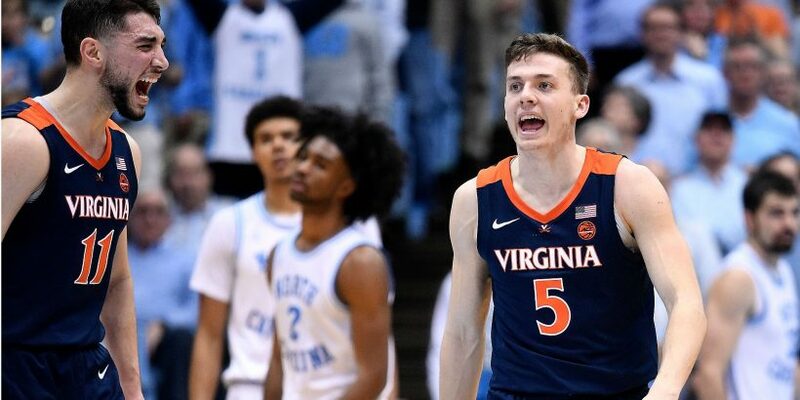 Virginia connected on 11 of its 20 3-pointers in its victory. Coby White scored 17 points for North Carolina in the losing effort. The Cavaliers improved to 21-2 (9-2 ACC) while North Carolina dropped to 19-5 (9-2 ACC). Virginia played two of its toughest games this season within a three-day stretch. The Cavaliers did not have a lot of time to prepare for North Carolina after they fell to No. 2 Duke, 81-71, at home Saturday. But, they showed few signs of fatigue and controlled the pace for most of the first half against the Tar Heels. North Carolina erased its deficit after the break, but the Cavaliers recovered over the last seven minutes. Virginia held the Tar Heels to just 37.1 percent shooting from the field and 31 percent from 3-point range. Virginia received clutch performances from its best players Monday. Kyle Guy and De’Andre Hunter each tallied 20 points to help lead the Cavaliers to the victory. The pair combined to shoot 60.8 percent from the field and knocked down eight total three pointers. Guy, especially, took over down the stretch for Virginia. He hit triples on back-to-back possessions with less than two minutes to play to help secure the win. Cavaliers guard Ty Jerome also chipped in 15 points and 11 assists. North Carolina continues to deal with injuries. Freshman forward Nassir Little left the game with an ankle issue early in the first half and did not return. He missed his only shot and did not tally a point before exiting the game. Little started out the season slowly but had recorded double-figure scoring totals in three of his last five games, including a 23-point performance in a win over then-No. 10 Virginia Tech. North Carolina is already dealing with injuries in its frontcourt, as Leaky Black and Sterling Manley are both sidelined. It would be a huge loss for UNC if Little is out for an extended period.